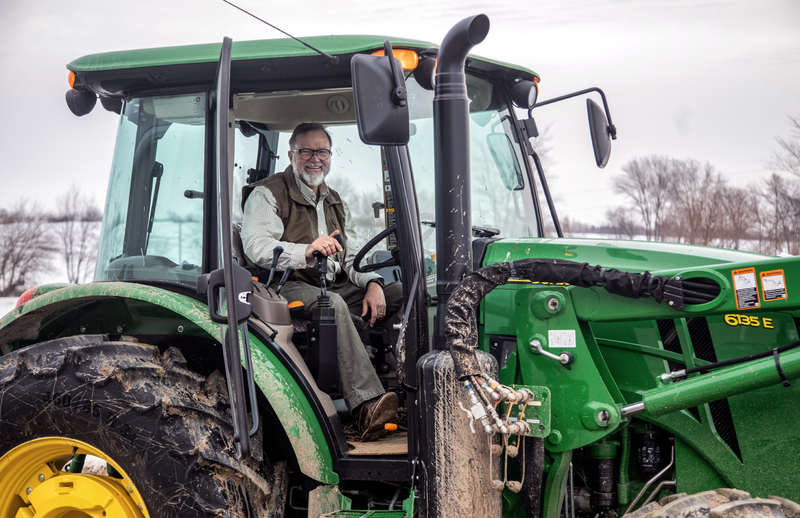 Bob Walker poses for a picture in his tractor while clearing the driveway to his farm on Friday, March 1. For a husband-and-wife team of a University of Iowa professor and lecturer, their dreams of settling down and farming weren’t enough. They wanted all of Iowa City to join them. 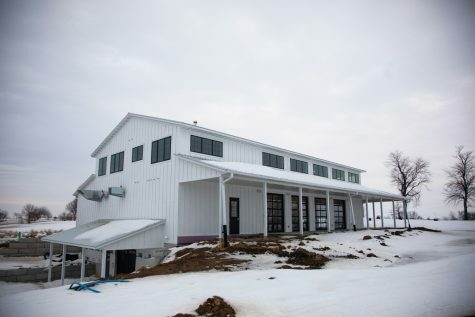 The date when Bob and Kristy Walker, a University of Iowa professor and UI lecturer, respectively, received their occupancy to start operating their winery proved nearly perfectly serendipitous: Feb. 19, one day after National Drink Wine Day. Of course, there’s more than just wine to be found at their Walker Homestead, which was constructed over the last few months; it’s a whole nexus for Iowa City and UI events. The Walkers both work at the Tippie College of Business. They live together on their 85-acre property several miles west of Kinnick Stadium, where, six years ago, they created a community-supported agriculture group. Bob said the homestead’s mission is to build community through agriculture education, and on both the agricultural and educational fronts, he, Kristy, and their colleagues have been working to ensure just that. I had the opportunity to visit the homestead on the chilly afternoon of March 1 to interview the Walkers and some of their colleagues. Driving out to the Walker homestead, my first thoughts were how rural the landscape really was. Though it’s only a 12-minute drive away from Kinnick, it seems unimaginable that a city of 80, 000 is so close by. I passed rolling hills and flat plains packed with the wintry remnants of crops; dilapidated barns surrounded by old wooden fences; and smaller, compact houses with rustic charm. David Gould, an administrator for the Belin-Blank Institute, met the Walkers in 2016 after agreeing to help a friend serve food at a fundraiser at the Walker homestead. 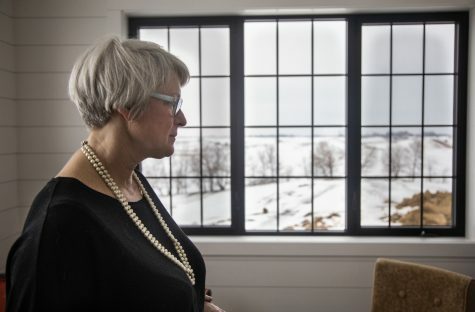 Gould said he was enraptured by the house’s views. Chefs Andrew Roers and Chris Greineer prepare food inside the kitchen of the Walkers’ barn on Friday, March 1. Shortly after I arrived, guests followed suit; the Walkers were hosting a gathering to celebrate the upcoming wedding of their son and his fiancée. As we walked to a higher level so as not to bother the arriving guests, Kristy discussed how she grew up on a farm, collecting eggs with her father and exchanging them for goods with her mother. The winery aspect of the homestead began with a single idea: “We like wine; we like going to Napa. So we thought we’d built a little bit of Napa out here,” Bob said. The pair bought 80 acres to the north of their farm in 2017 to produce five times more grapes. Kristy said she took classes at Kirkwood Community College to learn how to make wine, and she has made plans with Big Grove Brewery & Taproom to create wheat beer made with ingredients from their farm. The interior of the Walkers’ barn is seen on Friday, March 1. The venue will be used for community and university events. Despite the heavy local focus, both Bob and Kristy said operating within the regulations of Johnson County can be quite challenging. They can only host a dozen weddings annually, and they can have a maximum of 120 days allotted for agricultural events such as cooking classes or farm tours each year. On those tours, which will begin in early spring, visitors can interact with the chickens, turkeys, rabbits, goats, and pigs that the Walker farm is home to. Kristy said they were expecting sheep and highland cattle to arrive shortly. The farm offers classes on how to cook various animals, too. Bob said he and Kristy want the homestead to become a farm and table experience. The Walkers don’t walk alone when it comes to planting their homestead as a premier place to visit for the Iowa City community. They work with their friends and neighbors to help master this idea of a 21st-century farm. Iowa City native Shanti Sellz began Muddy Miss Farms in 2012 and works with the Walkers to distribute locally grown vegetables to a 50-member community-supported agriculture group. For $640, members get their pick of produce ranging from potatoes to peppers to pumpkins over a 22-week period. During my visit, off to the side, a pair of men were hard at work preparing a veritable buffet for the evening festivities. Closer to the oven, which hummed from consistent use, stood Chris Grebner. He was busy putting together a fresh batch of egg dough. 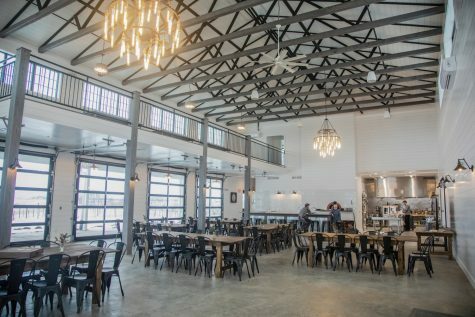 The kitchen and adjacent bar are constructed in a way that visitors can clearly see how the food is prepared and served. 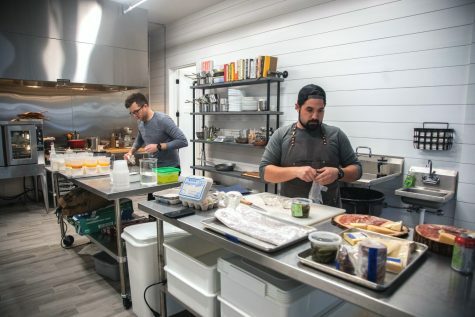 “This is one of the kitchens I’ll use for catering … as well as teaching classes,” Grebner said. The classes might involve participants traveling into the fields to find their own ingredients, he said, and long-term cooperation with the Walkers was definitely on the menu. “I’m setting up shop, and this is where I’m going to be at,” he said. Kristy Walker poses for a portrait on Friday, March 1. To Grebner’s left was Andrew Roers, who was putting the finishing touches on one of numerous platters of salami and cheese slices. He talked about the opportunity for visitors to become acquainted with the surroundings of the homestead and learn more about where their meals originate from. 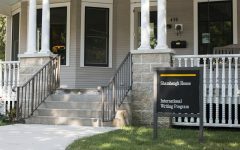 Beyond serving as a business, though, the Walker homestead serves as a gathering space for the Iowa City community, an opportunity for education that draws in both students and instructors from the UI. Gould discovered this firsthand when he volunteered for a function at the Walkers’ place and met the couple. He said he instantly thought of them as ideal hosts for his Green Room lecture series. “Anytime I brought something to them that had a community [aspect] to it, they would always say, ‘How can we help?’ ” he said. Through the Green Room, the Walkers hosted motivational speakers, book signings, and musical acts. 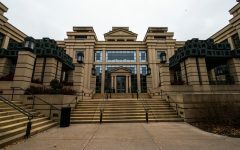 They have also hosted the international Tippie Friends and Mandela Fellows as university events, as well as various fundraisers (like the IowaWatch one in which Gould met Bob and Kristy) and even church functions. The Walkers’ barn is seen on Friday, March 1. The venue will be used for community and university events. So widespread is the Walker influence that, as I was interviewing Gould at the High Ground Café, a student sitting at a table next to ours pulled out his headphones and asked us if we were talking about Bob Walker. 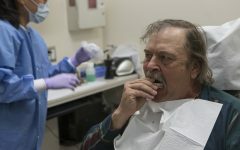 The student, senior Evan Hopper, said he’d often have conversations with Bob whenever he saw him in the hallways of the Pappajohn Business Building, and that he was well acquainted with the Walker farm. “He had us out there for an event for Sigma Nu Tau and we went out there, had a bonfire … we had a little potluck, and we were just kind of bouncing ideas off each other,” Hopper said. Bob also hosts some classes of his own, teaching entrepreneurship to his students by presenting a real-life example of it to them firsthand. He calls it his “living laboratory,” a locale in which his students can see just how all the principles he teaches them can be put into action. Perhaps, more than the sense of community fostered there, it’s the scenery that makes the homestead a prime candidate for a wedding venue. The first nuptials to be held there, in early May, will be for the same son and his fiancée whose engagement was celebrated when I visited the property.